Grey immediately lodged an official complaint at the Porte, instructing Beaumont to point out that the Turkish Government must not allow acts of war to be perpetrated in the Straits by the German ships. Souchon himself, meanwhile, was on his way to Constantinople having been picked up by the Hamburg-Amerika line steamer Corcovado, which had been armed as an auxiliary cruiser and, while at Constantinople, had taken on board the crew of the German stationnaire Loreley; it was the arrival of Corcovado that Wangenheim had waited nervously for that morning in the presence of Ambassador Morgenthau. Souchon’s other auxiliary – General, of the German-East Africa Line (complete with captive American doctor) – had arrived at the Straits during the night of 10/11 August, after acting as a W/T relay vessel during the final stage of the escape. Souchon, who began a round of talks with Wangenheim, Liman and Enver, quickly came to the conclusion that operations should begin in the Black Sea as soon as possible (Goeben needed 8,000 new boiler tubes and 50 boiler makers to fit them) and that German engineers should take the responsibility for strengthening the fortifications of the Straits. The British declaration of war against Austria on the 12th had ended, finally, any thought of a dash to the Adriatic, a fact which was acknowledged by the Admiralty Staff who instead approved Souchon’s Black Sea proposal ‘with the concurrence of Turkey or against her will.’ Although Souchon was to act in concert with Wangenheim, the Admiral was left with the discretion to commence operations if he thought that, by so doing, it would hasten the lethargic Turkish mobilization. Wangenheim, who had already had to cope with the frustrated Liman, now had another senior officer on his hands anxious to come to blows with the Russians. The arrival of the German ships sat oddly alongside Enver’s weekend offer of a Russo-Turkish alliance and, as Giers was quick to point out, the situation had not altered to Russia’s benefit: the self-esteem of the Turks had been considerably strengthened by the arrival of Goeben and Breslau and, the Ambassador believed, ‘may inspire them with temerity for the most extreme steps.’ Giers would follow Sazonov’s orders to vacillate with some reluctance as it was his opinion ‘that a decision should be taken without delay if we contemplate the possibility of joint action with Turkey, as even tomorrow it may perhaps be too late.’ When the Ambassador saw the Grand Vizier on the morning of Thursday 13th to press for the removal of the German crews he was, unlike Beaumont, given ‘assurances of a fairly satisfactory nature’ which, however, were not sufficient enough to remove the fears in St Petersburg ‘that Turkey intends to use Goeben for hostilities in the Black Sea.’ Prompted by these fears, Sazonov suddenly moved with alacrity. I hope you are not going to make a mistake which will undo all the services you have rendered Turkey & cast away the successes of the second Balkan War. By a strict & honest neutrality these can be kept secure. But siding with Germany openly or secretly now must mean the greatest disaster to you, your comrades & your country. The overwhelming superiority at sea possessed by the navies of England, France, Russia & Japan over those of Austria & Germany renders it easy for the 4 allies to transport troops in almost unlimited numbers from any quarter of the globe & if they were forced into a quarrel by Turkey their blow could be delivered at the heart. On the other hand I know that Sir Edward Grey who has already been approached as to possible terms of peace if Germany & Austria are beaten, has stated that if Turkey remains loyal to her neutrality, a solemn agreement to respect the integrity of the Turkish Empire must be a condition of any terms of peace that affect the near East. The personal regard I have for you, Talaat & Djavid and the admiration with which I have followed your career from our first meeting at Wurzburg alone leads me to speak these words of friendship before it is too late. Djemal later maintained that Limpus replied by letter the following day (Saturday 15 August) that, while he would not exceed the imposition placed on his activities by Djemal, in any event he was feeling very tired and wished to spend more time with his daughter at Therapia. Admiral Limpus and all officers of his mission have been suddenly withdrawn from fleet, replaced in their executive command by Turkish officers, and ordered, if they remain, to continue work at Ministry of Marine. I am at a loss to understand significance of this movement. Although I have been given to understand by a member of the Government that they are still anxious to get officers and crew of Goeben and Breslau out of the country it will probably mean retention at least of mechanics and technical experts which will create most dangerous situation in the face of attitude likely to be taken by Russia. There is very prevalent anxiety as to Russia’s intentions which could only be allayed by positive assurance from France and Great Britain that they will guarantee integrity of Turkey. Minister of Finance [Djavid] asked me point blank this afternoon if we were prepared to do this. Definite pronouncement of this nature would do much to clear the situation and would have best effect unless Turkey had already been too deeply compromised by mischievous intrigues. After Souchon had been instrumental in having Limpus removed, it was agreed that the two German ships would weigh anchor and proceed to Constantinople where, at Principo Island, Turkish officers would temporarily relieve their German counterparts before the warships steamed the short distance to the Golden Horn, there to be paraded publicly as Turkish ships. 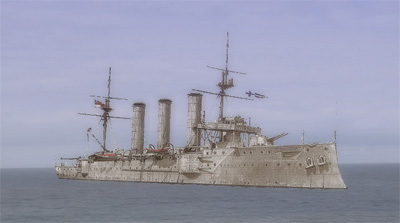 On the morning of the 16th the French steamer Ionic reported that she had witnessed Goeben and Breslau hauling down the German colours to hoist the Turkish before steaming away slowly in the direction of Ismid though with Souchon’s own ensign still fluttering — a personal reminder to the Turks as to who was really in charge. The sight of the German crews lining the deck, and of Souchon’s ensign, was too much for Captain Raouf Bey who had now returned from Newcastle having lost the command of one fine ship and who, having been promised the command of one of the German ships, saw himself being deprived a second time. 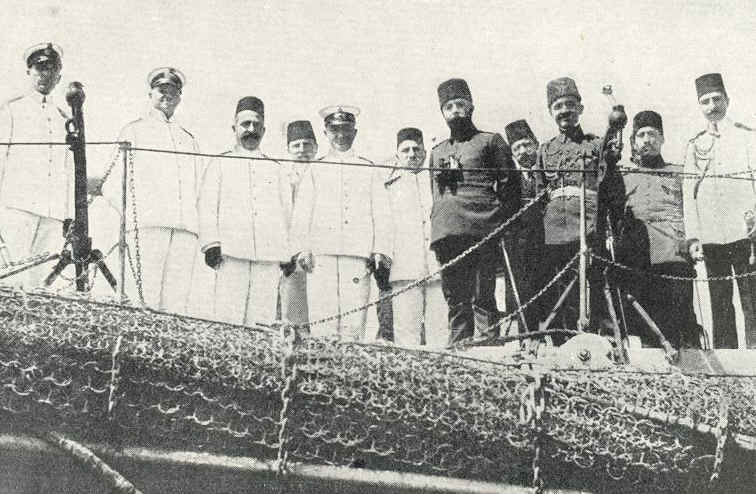 Just as eager as the British to see the repatriation of the German crew, when his complaint to Djemal was shrugged off, Raouf then asked to be made commander of the torpedo flotilla ‘so we can surround these ships and force the crew out.’ Raouf’s transparent patriotism was a liability for Djemal. The Minister of Marine had an ulterior motive in wanting Souchon in charge of the Ottoman fleet and the unfortunate Raouf was soon after dispatched to Afghanistan on a “diplomatic mission” — a characteristic act by Djemal but a poor reward for the Captain’s conspicuous services. Thereafter, the German ships would be a familiar sight, lying at anchor, their masts and funnels masked by the jumble of minarets tumbling down to the shore. As the grand ceremony was taking place in the Golden Horn Beaumont was again receiving the ‘most solemn assurances’ from the Grand Vizier of Turkish neutrality; desperate for anything to corroborate this, Beaumont reported ‘Good sign is that ships have now been transferred and are now flying Ottoman flag under nominal command of Turkish officer.’ The Chargé also credulously accepted the reasoning that some of the German crew would have to remain on board and that a ‘mixed crew of Germans and Turks under direct orders of Admiral Limpus would have been impossible combination and perhaps sufficient explanation for withdrawing him from executive command.’ Meanwhile, off the Dardanelles, Captain Kennedy aboard the battle cruiser Indomitable was collecting Mallet from an Italian mail steamer which had ferried the Ambassador on the last leg of his journey from London, via the Legation in Athens where Mallet had been brought up to date on events including the ‘sale’ of Goeben and Breslau. With the handing over ceremonies completed Souchon went ashore for a meeting that evening with his compatriots Liman, Kress and Bronzart — but with only Enver and his second in command, Hafiz Hakki, representing the Turks. Inevitably, Enver was pressed to speed up the mobilization before attention was turned to the various strategic alternatives available to the Turco-German forces. Liman’s suggested option was for a landing of Turkish troops on the Black Sea coast between Odessa and Ackermann, to divert Russian troops and so relieve some of the pressure on the southern wing of the Austro-Hungarian front. Black Sea operations were, however, deemed to be politically inexpedient as they might incite the British to try to force the Dardanelles, whose defences at the time were ‘seriously deficient’. The preferred scheme (which also had Souchon’s backing) was for an attack on Suez for the dual purpose of restoring Turkish sovereignty and cutting off British reinforcements en route to the Western Front. Liman, with some justification, could not understand how it was proposed that Turkey, with her limited resources and poor communications, could hope to conquer Egypt and his reluctant acceptance that this was indeed the intention only added to the General’s discomfiture; he was unhappy and wished to return home, a request that was, understandably in the circumstances, denied. Some hours before this decision was taken in Constantinople Admiral Milne had, in response to an urgent entreaty from Cheetham in Cairo, ‘in view of anticipated movement of Turkish troops and attempted blocking of Canal’ detached the cruiser Black Prince to remain at Suez. With the British therefore expecting trouble in Egypt and the Russians similarly anticipating Turco-German operations in the Black Sea the opportunities for Enver and his cohorts to achieve strategical surprise were limited. In addition, when the plans for the mooted Black Sea landings became more widely known in Turkish military circles they ran into internal opposition. The Assistant Chief of Operations, Major Sabis, complained that the Russian Black Sea fleet would first have to be destroyed to ensure the safe passage of the slow Turkish transports on their 300 mile trip; Sabis’ objection was duly noted. In case this was not sufficient to discourage the Germans, the Major also warned the Turkish officers who were working with Souchon ‘not to show our naval strength as being more than it is.’ He did not have much to worry about: the condition of the Turkish fleet was so appalling that Souchon suspected it had been the deliberate policy on the part of the Limpus’ mission to maintain the fleet in the lowest possible fighting condition. But Souchon, by his vigorous desire for action, which went counter to the Ottoman intention of remaining neutral for as long as possible, fell into a trap of his own making. Now, as head of the Ottoman Navy, the onerous duties and responsibilities of the task virtually chained him to the Corcovado where he complained, in long letters to his wife, of his inability to get at the Russians and bemoaned that if he had really wanted to do nothing he would, after all, have steamed to the Adriatic when being pursued by the British and there joined the supine Austrian fleet. The realization soon dawned upon him that, appearances to the contrary, the Turks were effectively in control; Souchon could not hope to roam the Black Sea in his battle cruiser looking for a scrap with the Russians while always counting on being able to fall back, if necessary, and obtain sanctuary in the Straits by the grace of a still neutral Turkey. If he provoked the Russians against the wishes of the Turks and attempted to return to his safe haven the Turks could disavow his actions as those of an ‘insubordinate troublemaker’ and possibly bar his passage. Djemal’s ploy had worked for, while Souchon could, at any time, be disowned, Raouf, if he had assumed command of Goeben, most certainly could not. When Mallet eventually returned, the Ambassador too was trapped by the belief that his good offices still carried weight at the Porte. Beaumont’s conflicting telegrams had estranged opinion in the Foreign Office where, as in the Admiralty, Turkey had almost been given up as lost. The Turks were running rings around the Chargé; Mallet thought he could reverse this. Ryan was not alone in feeling relieved when Mallet arrived back late on the 16th and ‘scored one immediate success by obtaining permission for the outward passage through the Straits of British ships with cargoes from the Black Sea.’ Mallet had argued, with Bompard supporting him, that Grey’s warning for British ships to leave Turkish waters would be construed as indicating the intention of Britain to attack Turkey at once and would, therefore, cause panic in Constantinople. Grey replied that the Turks, by detaining a number of British merchant ships, had raised fears that they intended to seize them; however, he added, ‘if there is no ground for such apprehension, and Turkey will give ordinary facilities for British merchant vessels, you have full discretion to instruct British shipping everywhere to proceed as usual.’ About 70 of the 80 ships in the Black Sea were thus able to escape the danger of immobilization as Ryan, who kept a card index of the ships, played, late at night, ‘a sort of game of patience’ of the ‘ins’ and ‘outs’. The quandary of Turkey was raised once more in the Cabinet which met at noon on Monday 17 August. For Churchill the Goeben affair was an affront on two counts: he had personally drafted the early operational telegrams to Milne and could not therefore escape a share of the responsibility for the escape; and second, if Turkey did join the Central Powers, the impression would be that the incident which had finally tipped the scales was his pre-emption of the two Turkish dreadnoughts. ‘Turkey has come to the foreground,’ Asquith wrote to Venetia Stanley of the Cabinet discussions, ‘threatens vaguely enterprises against Egypt, and seems disposed to play a double game about the Goeben & the Breslau. Winston, in his most bellicose mood, is all for sending a torpedo flotilla thro’ the Dardanelles — to threaten & if necessary to sink the Goeben & her consort.’ Crewe, the Secretary of State for India, and Kitchener both urged caution: let Turkey strike the first blow, they argued, to avoid upsetting the Muslims. Asquith agreed. As he was getting nowhere, Churchill then protested to Grey of the ‘extremely unsatisfactory’ situation: not only had the repatriation not taken place but ‘probably the whole of the German crews are still on board’, a condition which resulted in two British battle cruisers ‘which are urgently required elsewhere’ having to watch the Dardanelles. was much impressed and relieved. He said that it would help him enormously. He assured me that present crisis would pass, and that I need have no fear lest Turkey would be drawn into hostilities against us or Russia. I am convinced of his absolute personal sincerity. If anything, Said now regretted putting his signature to the alliance on 2 August; indeed, he now claimed to have been duped by the Germans, who had misrepresented the disposition of Bulgaria. The Grand Vizier still favoured the creation of a four-power Balkan bloc which, he maintained, had more to gain by remaining neutral; but Said could not convince his more rabid colleagues. Instead, four options were canvassed: one, the Bulgarians should be persuaded to mobilize; two, if they refused, a Roumanian-Bulgarian-Turkish defensive bloc should be established; three, a four-power bloc should be created which would be – against the wishes of the Grand Vizier – offensive in character; four, if all else failed, a defensive alliance with the Greeks. In furtherance of this objective, talks were reopened with the Bulgarian and Roumanian governments. Talaat travelled to Sofia where he signed a treaty with the Bulgarians the existence of which was kept secret even from Wangenheim, who only learned of it the following December. The first four articles of the treaty pertained to the customary promises of friendship, territorial integrity and mutual action of both parties in case of attack by another Balkan state. The effect of all this was, though, diminished by Article V which made Bulgarian action completely dependent upon an ‘adequate guarantee’ from Roumania that she would not interfere. In the circumstances, it is difficult to see what form this guarantee could have taken. Mallet’s surmise was accurate: by reaching an accommodation with Greece, Enver hoped thereby to remove an obstacle in his quest to precipitate action against the Russians. Talaat eventually left Bucharest on 31 August, leaving Halil to conduct the negotiations. On his way back to Constantinople Talaat stopped at Sofia to try to persuade the equivocating King Ferdinand of the need for Bulgarian co-operation but, citing Austrian reverses against Serbia and Roumania’s ambivalent attitude, Ferdinand again refused to commit himself. Bulgaria could not attack Serbia for fear of drawing in Greece and Russia against her. Upon reaching Constantinople Talaat decided on a new approach: on 6 September he informed Wangenheim that, failing a Greek declaration of neutrality, Halil would be recalled and the negotiations suspended. Talaat demanded that further German pressure should be exerted on Athens and the Greeks warned that the islands question would become a casus belli if they failed to issue the declaration. The Germans went so far as to have their Minister in Athens sound out Streit, but the Greek Foreign Minister’s violent reaction confirmed German fears that any ultimatum would push the Greeks into the Entente camp. Instead, any pressure emanating from Berlin was directed back at Talaat: he was instructed to stop making waves with Greece and, if he must attack someone, attack Russia — a prospect Talaat viewed with something less than equanimity. At the same time, the anti-interventionist group at the Porte, aware of the real reason for the Greek negotiations, preferred to adjourn the discussions rather than reach a settlement. So long as the dispute with Greece remained, they believed, the scope for military adventures elsewhere was considerably reduced. Halil was ordered to suspend negotiations in Bucharest while ‘Turkey made a proposal to Greece, believed to be at the instigation of Germany and thoroughly insincere, for a neutrality agreement by which neither should take part in the war.’ More time had been bought by the Turks. should like to make it clear that…presence of British fleet at Dardanelles is a wise precaution in view of possibility of coup d’Etat with assistance of Goeben and complete control, exercised by military authorities under German influence. It is for His Majesty’s Government to consider how far forcing of Dardanelles by British fleet would be an effective and necessary measure in influencing general outcome of war should situation here develop suddenly into a military dictatorship. Beaumont to Grey, no. 524, 11 August 1914, PRO Adm 137/HS19. Grey to Beaumont, no. 363, 12 August 1914, ibid. Nauen to Goeben, no. 68, 9 August 1914, PRO Adm 137/4065. See, The Shirey Story, Appendix iv. Admiralty Staff of the Navy to Goeben, no. 77, 14 August 1914, PRO Adm 137/4065. Giers to Sazonov, 12 August 1914, quoted in, Albertini, III, p. 622. Beaumont to Grey, no. 536, 13 August 1914, PRO FO 371/2138. Buchanan to Grey, no. 287, 15 August 1914, ibid. Grey to Bertie, no. 533, ibid. F. A. K. Yasamee, “Ottoman Empire”, in Keith Wilson (ed. ), Decisions for War (London, 1995), p. 245. Buchanan to Grey, no. 288, 16 August 1914, PRO Adm 137/HS19. 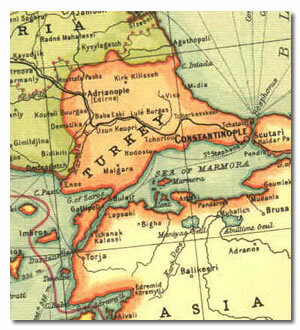 Howard, The Partition of Turkey, pp. 98-9. Bertie, Diary, entry for 11 August 1914. Admiralty to C-in-C, Medt., no. 248, 12 August 1914, PRO Adm 137/HS19. Admiralty to C-in-C, Medt., no. 252, 15 August 1914, ibid. Troubridge was to shift his flag, temporarily, to one of the battle cruisers. Churchill to Grey; Churchill to Enver Pasha, 15 August 1914, WSC Comp. vol. III, pt. i, pp. 38-9. Churchill’s message was telegraphed to Beaumont at 5 o’clock on the afternoon of 15 August: see, ‘Telegram to Mr Beaumont, private, Following from First Lord of the Admiralty for Enver Pasha.’ Grey mss., PRO FO 800/80. Beaumont to Grey, no. 535, 13 August 1914, PRO Adm 137/HS19. Beaumont to Grey, no. 539, 14 August 1914, ibid. Limpus to Churchill, 26 August 1914, WSC Comp. vol. III, pt. i, pp. 56-60. Beaumont to Grey, no. 539, 14 August 1914, PRO Adm 137/HS19. Turkey’s ‘only chance of existence,’ Limpus confided to Churchill, ‘is to remain absolutely neutral. I am doing all that I can to put this view before Ministers and others.’ Limpus to Churchill, 26 August 1914, WSC Comp. vol. III, pt. i, pp. 56-60. Djemal to Limpus, 14 August 1914, Ryan mss., PRO FO 800/240. Djemal, Memories of a Turkish Statesman, p. 121. Beaumont to Grey, no. 545, 15 August 1914, PRO Adm 137/HS19. Minute by Crowe, PRO FO 371/2138. Situation in Turkey, Crowe to Grey, 16 August 1914, PRO FO 371/2138. Grey to Beaumont, no. 382, PRO Adm 137/HS19. Beaumont to Grey, no. 546, 16 August 1914, ibid. Beaumont to Grey, no. 547, 16 August; minute by Churchill to the Secretary and the Chief of the War Staff, 17 August 1914, ibid. Grey, Twenty-five Years, vol. II, p. 165. Captain Kennedy to Rear-Admiral Troubridge, 17-18 August 1914, Lumby, pp. 442-5, para. 4b. Kurat, How Turkey drifted into World War One, p. 304. Beaumont to Grey, no. 547, 16 August 1914, PRO Adm 137/HS19. Kennedy to Troubridge, 17-18 August 1914, Lumby, pp. 442-5, para. 2. 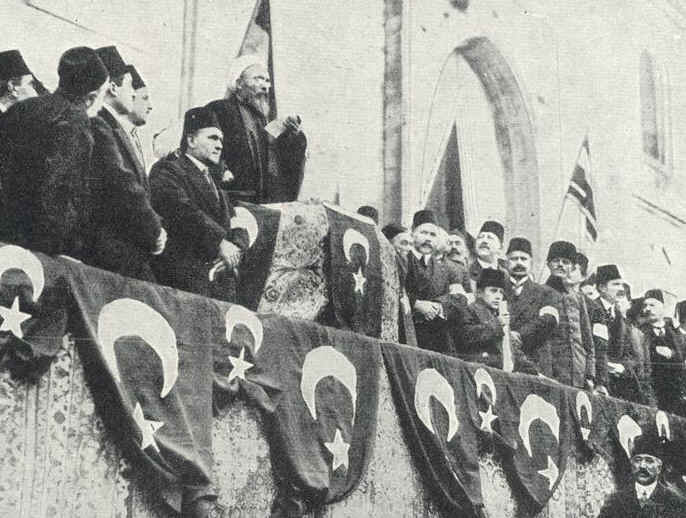 F. A. K. Yasamee, “Ottoman Empire”, in Keith Wilson (ed. ), Decisions for War (London, 1995), p. 246. Kurat, How Turkey drifted into World War One, p. 305. Liman von Sanders, Five Years in Turkey, pp. 25-6. C-in-C, Medt to Admiralty, no. 433, 16 August 1914, PRO Adm 137/HS19. Kurat, How Turkey drifted into World War One, p. 306. State and Condition of Turkish Warships, October 1914, PRO Adm 137/881; Halpern, The Naval War in the Medt., p. 49. In fairness to Limpus, he was never given the resources that were at the disposal of Souchon nor did he receive the co-operation from the Turks which Souchon demanded. Limpus complained, late in August, that another 90 German sailors were on their way to Constantinople from Sophia, whereas ‘I had very great difficulty getting even a few petty officers for Turkey from England.’ [Limpus to Churchill, 26 August 1914, WSC Comp. vol. III, pt. i, pp. 56-60.] By comparison, the Imperial Marine Office had signalled Goeben on 14 August ‘How many sea-officers, engineers, warrant officers, Petty officers, and inferior ratings are needed for Turkish warships? All that Turkey needs will be supplied as far as possible…’ Imperial Marine Office to Souchon, 13/14 August 1914, PRO Adm 137/4065. Halpern, The Naval War in the Medt., p. 48. Halpern, ibid. ; Trumpener, Germany and the Ottoman Empire, pp. 42-3. Ryan, The Last of the Dragomans, p. 96. ‘[H]appily,’ Asquith wrote on 19 August, ‘Louis Mallet is now back again at Constantinople.’ Asquith to Venetia Stanley, Asquith Letters, no. 125, pp. 178-80. Mallet had also arranged to keep Captain Kennedy in touch with events by letter or cable. Mallet to Grey, no. 556, 17 August 1914, PRO FO 371/2138. Grey to Mallet, no. 396, 18 August 1914, ibid. Ryan, The Last of the Dragomans, p. 96. Asquith to Venetia Stanley, 17 August 1914, Asquith Letters, no. 123, pp. 170-2. Churchill to Grey, 17 August 1914, Lumby, no. 415, p. 441. Mallet to Grey, no. 557, 18 August 1914, PRO Adm 137/HS19. Limpus was advised on 23 August that Enver had had a small operation on his foot and, generous to a fault, the Admiral informed Churchill ‘Whether he is really laid up, or whether he is avoiding unwelcome advice I do not know. My evidence, poor though it is, favours the former view.’ Limpus to Churchill, 26 August 1914, WSC Comp. vol. III, pt. i, pp. 56-60. Kennedy to Troubridge, 17-18 August 1914, Lumby, no. 417, pp. 442-5, para. 15 and note 1. Grey to Churchill, 18 August 1914, WSC Comp. vol. III, pt. i, p. 41. Admiralty to Rear-Admiral, Defence, no. 7, 18 August 1914, PRO Adm 137/HS19. F. A. K. Yasamee, “Ottoman Empire”, in Keith Wilson (ed. ), Decisions for War (London, 1995), pp. 244-5. Theodoulou, Greece and the Entente, pp. 30-8; George Rendel, Third Secretary, Athens Legation, Notes on the Proposed Greek Participation in the War, St Antony’s College, Centre for Middle East Studies, DR 701.G6 [hereinafter referred to as ‘Rendel, Notes’], passim. Mallet to Grey, no. 747, 11 September 1914, PRO FO 371/2141. Yasamee, “Ottoman Empire”, in Wilson (ed. ), Decisions for War, p. 249. Rendel, Notes, entry for 10 September 1914. Mallet to Grey, no. 562, 18 August 1914, and minute by Oliphant, PRO FO 371/2138. Djemal, Memories of a Turkish Statesman, pp. 123-4. The transport would arrive back at daybreak on 22 August. Mallet to Grey, no. 561, 18 August 1914, PRO Adm 137/800. As the range of our activities is so diverse, we have a number of different websites. 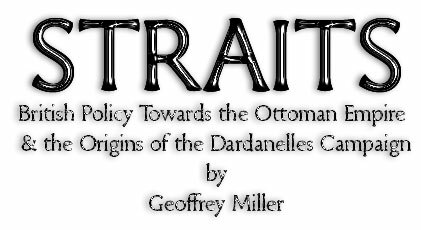 The site you are currently viewing is wholly devoted to the second of the three non-fiction books written by Geoffrey Miller, and deals specifically with British policy towards the Ottoman Empire and the origins of the Dardanelles Campaign. The main Flamborough Manor site focuses primarily on accommodation but has brief details of all our other activities. To allow for more information to be presented on these other activities, there are other self-contained web-sites. All our web-sites have a LINKS page in common, which allows for easy navigation between the various sites. To find out where you are, or to return to the main site, simply go to the LINKS page.